Few families can boast that they own an island in the Pacific but I have found that there are no strangers to the families on Yap and the family I get to visit has pet Manta Rays that you can play with and photograph everyday. Last Spring year myself and eight fellow adventurers traveled from Okinawa to Yap, an island in Micronesia just below Guam and above Palau. Our Pre-Easter adventure focused on diving with Big Animals (Manta Rays) and enjoying some of the most pristine reefs Pacific. Yap is certainly famous for the Manta Rays that call Goofnuw and Mill Channels home throughout the year but you will be surprised that while the Dive World's focus has been on Manta Rays, Bill Acker and his crew at Yap Divers have been reconnoitering the reefs that surround this island that has 17 miles of reef. And that is a lot of reef! Geof Loe, assisted by the eight dive guides at Yap Divers, have all been out for the past three years setting up, or repairing, mooring buoys at more than 15sites that presentdivers with exciting wall, drift, cavern, macro, coral, and of course big animal diving on Yap. During our seven day Easter Holiday we dove with the Mantas every morning at first light and then shifted south toward the Yap Caverns for our second dive either in the caverns, Lionfish Wall, or over to Magic Gardens. The best word to describe these sites is WOW! Gentle currents drift you into the Caverns or along the vertical walls. 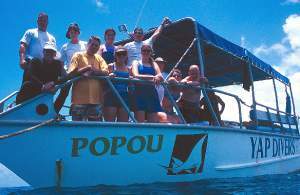 Over at Magic Gardens we rolled off our dive boat "Popoe" and into crystal clear water with white tip sharks circling beneath us. What was the excitement factor? Huge! If that was not enough our dive guide, Colin Adams (one of the most enthusiastic British Dive Guides on Planet Earth) eased us up to Eagle Ray point where we counted 20 Eagle Rays gliding in formation flying on the currents that are gently sweeping up from Big Bend. After a 60 minute dive, which was safely extended by a 32% blend of NITROX, we surface back to Popoe to find a huge spread of food waiting for us. Chef Bill Munn, Acker's Executive Chef at he Manta Ray Bay Hotel, had prepared a wonderful lunch for our "At Sea" enjoyment. Our third dive of the day was filled with sharks and turtles and what seemed to be unlimited array of hard coral spread enjoyed by everyone yet another 60 minute dive. I have described for you a normal day on Yap. We enjoyed six days, back-to-back. Expect that your new family on Yap will ask you to get up early so that you can greet the Manta Rays on the incoming tide, or wait till mid morning and hit the walls down South. Your family on Yap is waiting for you and what a family it is! This was my second visit to Yap this year. Everyone on Yap will make you feel like family from the minute you step of the plane. You will never forget their hospitality. Yap is MORE THAN MANTA RAYS and the Manta Rays are magnificent. Please take the opportunity to include these wonderful people into your diving family. This Fall we are planning another Manta Ray adventure to our own Ishigaki Island right here in the Okinawa Prefecture. If you are interested in joining us please contact myself at jwchandler.com or visit FATHOMS Web Site at fathoms.com for details.We are going in search of the migrating Manta Rays once again. See you at the Beach.